I’m making this Bento Sandwich for my elementary school student. I recalled her school results were terrible when I first taught her, but her grades have improved tremendously since. I promised to make her something nice if she’s obedient & does her homework diligently, so this is it! 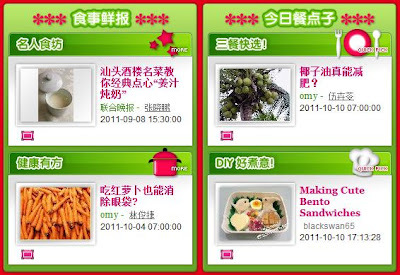 Recipe Featured @ OMY-食天堂Eat as DIY 好主意! I like to pamper my students, both kids & adults. Even grown-ups need motivation too. 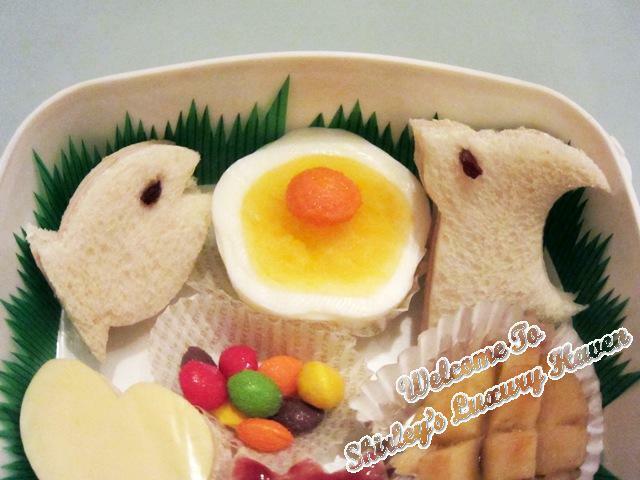 I believe in bonding with my students, that’s why I always like to make nice food for them. Sometimes, they’re my “guinea pigs” for my cooking experiments too. LOL! 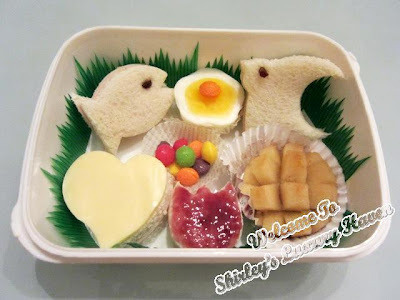 I love making Bento as it brings back the good-old-days of preparing Bento, making cute food when my son was younger. Winner of Breakfast Ideas @ Mad About Kids! These Bento Sandwiches here are fuss-free & ready in no time. I hope you’ll enjoy making them for your kids as much as I do. Using your fave moulds, cut out shapes from bread, cheese & ham. Spread butter on bread. & layer bread to make sandwich. Using raisins, add eyes to fish & swallow. I’d added cheese on top of the heart & jam to tulip. To make flower plum, cut it criss-cross & gently bend the fruit outwards. Using an egg mould, insert a hard-boiled egg & leave it closed for 5 mins for shape to form. Have fun! September - WWC - "Cornmeal for Breakfast"
What a lovely teacher, no wonder your students are motivated to perform well. Hey! i'm also your student - the "cyber" way. LOL! You are such a thoughtful teacher, Shirley! your students are so lucky to have you as their mentor. This is just absolutely gorgeous! And the sandwiches are yummy. I like how this is so healthy, a really balanced meal. Something I would prepare when I have kids of my own. Doris, ok, ok, I get the hint. Hahaha! Ken, glad u're a big kid! Heehee! I always admire your Bento sets Shirley, like I always say, you have the great patience and very creative. Looks very appetizing for me. Nava, thks for your generous comments! Teachers need to be very patient, else I'll age very fast. Hahaha! Umm, omg! I'm so happy! It's strange since I've managed to link the pix there successfully. Can I email u the pix instead? Thks a million! completely adorable! I would love to be a kid just to have those :) lovely post thanks for sharing! What a treat to open a lunch box and find this! Your "TLC" is evident, Shirley, as a teacher and as a Mom! Your students are so fortunate to have you for their teacher. I am sure they love all the food you send their way, guinea pig or not :) Never tried making a plum hedgehog but that is an excellent way to serve it. Thanks for your participation in Bento Banter. Please keep posting your cute and healthy bentos. Thanks for linking back to me. You are the best! Now Serving, welcome to Bento Making! Thks for dropping by & I'll be popping by your site soon! Kimby, it's always nice to see your comments. They're so encouraging! 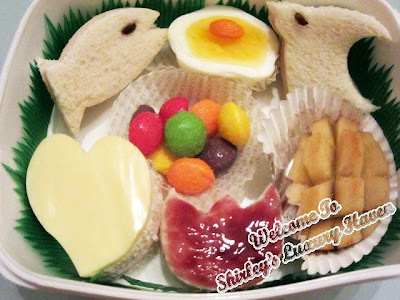 Great Bento Shirl. Somehow am in such a tearing hurry in the morning, just cant shape everything like that. Wonder when I'll get there. Shirley, did u use moulds too? It cuts down a lot of time, dear! Hope it turns out better next time. and u are really such a good teacher! good encouragement for the students! Raquel, "bribing" my students through their stomachs does help to motivate them. Hahaha! Alisha, I'm sure u can do better than me with your creativity! 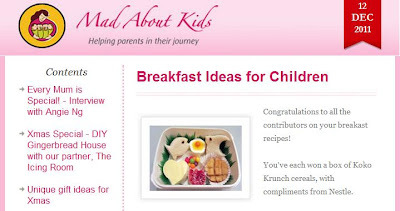 Bento boxes are so much fun for both adults and children. Your students are very lucky to have such a sweet and talented teacher. These are adorable! Great reward and a great job to your student for such improvement. Lequan, I'm sure your kids will love these too! Thks dear, you're always so sweet with your comments! this is very cute. my whole family will surely love this as well. thanks for posting it. Charenn, I'm loving it :) Glad u like it too!